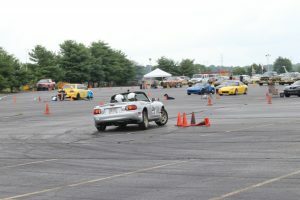 Cincinnati Region SCCA hosted their Point Event #4 at Traders World International Raceway! 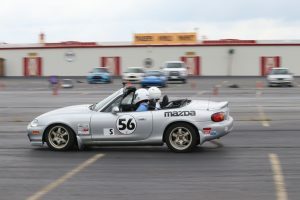 Though the weather forecast wasn’t very promising (and at the same time, rain or cold day actually help me fight against more powerful cars), it ended up we had no rain at all for all 3 heats, and we all got 6 runs, and even some fun runs, despite some timing issues we experienced toward end of the day. I tried hard, and maybe tried a bit too hard, but did not do that well overall. I had more cone counts than total number of cones I hit in first 3 events all together! 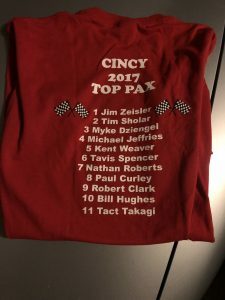 It is really nice of him for making a special t-Shirt (the original one was only the real top 10 drivers). Thank you so much Kent! Also, a special Shout out to Mike Riegel for shooting awesome photos! Thank you!